Japan’s new manager is ready to lead the next generation on the road to the 2020 Tokyo Olympics. 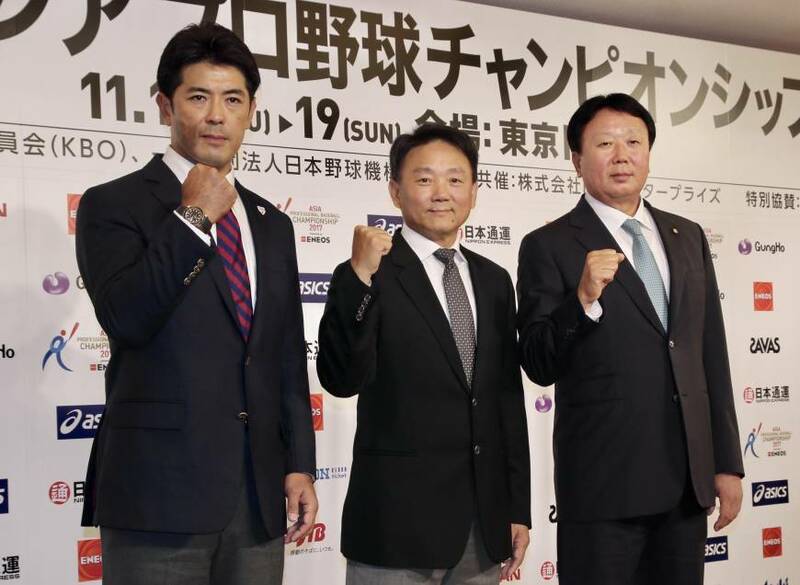 The first stop along the way comes next month, when Samurai Japan takes on South Korea and Taiwan during the Asia Professional Baseball Championship from Nov. 16-19 at Tokyo Dome. Samurai Japan skipper Atsunori Inaba, who will be making his managerial debut during the tournament, announced his 25-man roster during a news conference Thursday afternoon. As will be the case in 2020, the rosters for the event are comprised of players age 24 and under, with teams able to carry three overaged players. Inaba called up a few notable players who could also figure into his plans down the road, including All-Star rookie Taisuke Yamaoka, a 22-year-old pitcher from the Orix Buffaloes, and 20-year old Tohoku Rakuten Golden Eagles outfielder Louis Okoye, the second-youngest player on the team behind Hokkaido Nippon Ham Fighters pitcher Mizuki Hori, who is 19. A pair of talented rookie shortstops were also chosen, with the Seibu Lions’ Sosuke Genda, who finished second in NPB with 37 stolen bases this season, and the Chunichi Dragons’ Yota Kyoda selected. The Japanese team features seven NPB All-Stars from this past season in Genda, Yomiuri Giants pitcher Kazuto Taguchi, Chiba Lotte Marines catcher Tatsuhiro Tamura, Fukuoka SoftBank Hawks outfielder Seiji Uebayashi, Hiroshima Carp pitcher Kazuki Yabuta, Yamoka and Yokohama BayStars pitcher Yasuaki Yamasaki. Yamasaki, Taguchi and Chunichi Dragons hurler Katsuki Matayoshi have all suited up for Samurai Japan in the past. “We would like them to guide the team and pass on their knowledge to the other players,” Inaba said. Inaba also named three overage players, calling up Matayoshi, Hawks catcher Takuya Kai and Seibu Lions infielder Hotaka Yamakawa. Yamakawa was a huge presence for the second-place Lions late in the season, hitting .326 with 19 home runs and 47 RBIs during games played in August, September and October. “Yamakawa began hitting in the cleanup spot from the middle of the season, and he is certainly one of the players we would like to see hit from the middle of the lineup,” Inaba said. Inaba also mentioned he had trouble finding players to play first and second base, noting that foreign players usually man first while the top second basemen are veteran players such as the Carp’s Ryosuke Kikuchi and Lions’ Hideto Asamura. The manager will also continue watching different players at every position in the future. Three NPB players will suit up for Taiwan under manager Hong I-chung. Giants outfielder Daikan Yoh and Marines pitcher Chen Kuan-Yu join the team as overage players. Seibu Lions infielder Wu Nien-ting was also selected. Team Korea is entirely made up of players from the Korea Baseball Organization. No overage players were selected. That squad will be led by manager Sun Dong-yol, a former reliever for the Chunichi Dragons from 1996-1999. “I feel like I never got a hit against him,” Inaba said. Sun converted 98 saves in Japan, including 38 in 1997, which gave him a share of the then-NPB single-season record with the Yokohama BayStars’ Kazuhiro Sasaki. “Japan has pitchers who have great command and have very capable hitters as well,” Sun said. “They also play very fundamental baseball. I’ve also played against Taiwan as a player and coach. I have the impression they have power both in their hitting and pitching and have players who can scare you.